Risen brings an all-new perspective to the Easter story. "Witness the manhunt that changed the course of human history"
Clavius, a powerful Roman Military Tribune stationed in Jerusalem, has been tasked with investigating a missing person: the recently crucified Yeshua, whose very own execution was overseen by Clavius and his aide Lucius. Despite having stationed two of his own guards at the tomb, which he also sealed with a boulder and bound with rope and wax, the body had simply vanished. With rumours of resurrection surfacing among the people, and no body to disprove them, the tentative peace of the area is becoming threatened. Believing the disciples of the deceased to have stolen the body in order to fuel the rumours of Yeshua returning to life, Clavius begins to chase them down. All the while, up in his palace, Pontius Pilate is struggling to keep his grip on the people. With Pilate breathing down his neck, and with still no body to be found, Clavius is becoming more and more desperate. Rome is failing in it's grip on Judea, the people are become restless, and yet Clavius is no closer to solving the mystery of the missing body. Everything he sees appears to lead up one, impossible, conclusion. The one conclusion Clavius was in no way prepared to reach. What if Yeshua really is alive? Directed by Kevin Reynolds (The Count of Monte Cristo, Waterworld), and starring the BAFTA nominated Joseph Fiennes (Shakespeare in Love), as well as Tom Felton (the Harry Potter series) and Cliff Curtis (Sunshine), Risen brings a wholly unique approach to the story of the resurrection, and its impact on the time. Told from the point of view of a character who not only didn't believe, but who had to disprove it at any cost. It's the story of the most important man-hunt every to have happened. Of looking for a man who dies, but instead finding one who has Risen. Risen DVD was published by Sony in July 2016 and is our 217th best seller. 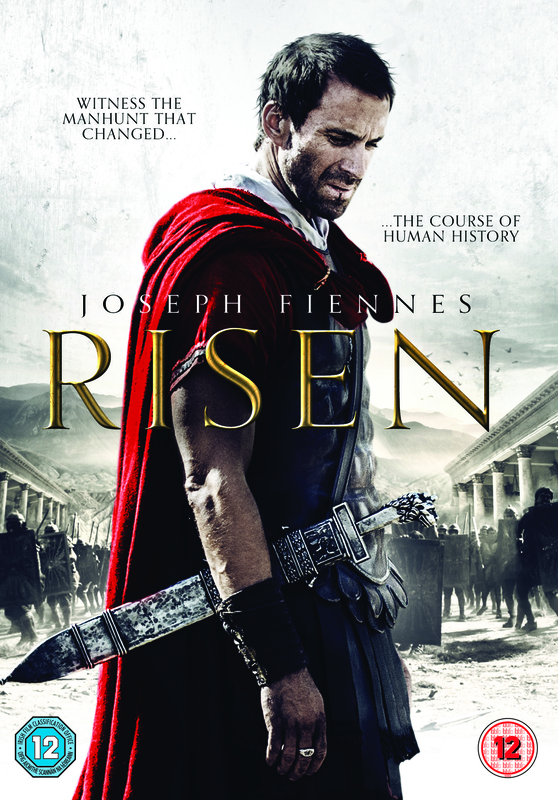 The ISBN for Risen DVD is 5035822307131. Great fresh new way of looking at Jesus rising from the dead. One or two bits you may wonder where they are going but overall a great movie. Got a question? No problem! Just click here to ask us about Risen DVD. Hello, Does this DVD have subtitles in French? Thank you! Also, I would not recommend it for young teens before 14, as the beginning of the film is very violent. Thank you. A:This DVD has subtitles in English and Polish, but not French. Thank you for using the Q&A Forum. A:Risen does not come under your CVL I'm afraid. There is a 'Single Title Screening Licence' which can be purchased for a single showing and covers an DVD release, regardless of Studio. ] More information can be found here: http://www.filmbankmedia.com/licences/stsl/ I hope this is of help to you. Risen is a genuinely good film and runs with a solid premise for a new way of looking at the classic Easter story. Thank you for using the Q&A Forum. A:As this film has a 12 certificate from the BBFC, young teens should be fine with it. This comes from some scenes of violence including a battle sequence which is action packed, and a lingering Crucifixion scene as well as several shots of exhumed bodies. There is also a brief reference to a character having being a fairly well-established prostitute amongst the Roman Soldiers. All in all,the film is thrilling and relatively inoffensive, with the shots of bodies being a little grim for anyone of a particularly weak disposition. Hope that clears things up. Thank you for using the Q&A Forum. A:Yes, the film does have Subtitles in both English and Polish, as well as Subtitles for the hard of hearing in English. Thank you for using the Q&A Forum. Risen is the epic Biblical story of the Resurrection, as told through the eyes of a non-believer. Clavius (Joseph Fiennes), a powerful Roman military tribune, and his aide, Lucius (Tom Felton), are tasked with solving the mystery of what happened to Jesus in the weeks following the crucifixion, in order to disprove the rumours of a risen Messiah and prevent an uprising in Jerusalem.